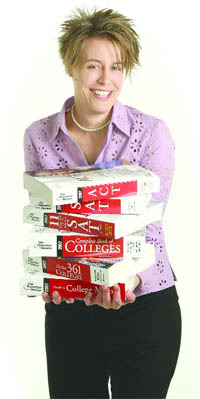 Carin Zinter says most people take the SAT (Scholastic Aptitude Test) once, maybe twice, and that’s certainly enough for a lifetime. “Most say it’s an experience they wouldn’t want to repeat if they could avoid it,” she said, noting quickly that she has to take the test at least once every year as part of the process of staying certified to tutor young people in how to take the SAT and other standardized tests, and to train those who do the tutoring. And Zinter, director of Human Resources for the Princeton Review, doesn’t seem to mind; you wouldn’t either if you scored 2,390 out of a possible 2,400 on the last go-round. There are many factors that go into notching a score like that, she said, including an ability to avoid some of the pitfalls that test designers incorporate into their work. Zinter has been posting some impressive numbers outside her work as well. Like many other members of the inaugural Forty Under 40 club, she likes running long distances. In her case, it’s triathlons (specifically, half-Ironmans, featuring a 1.5-mile swim, a 56-mile bike ride, and a 13.1-mile run) and ultra-marathons, with 50 miles being the norm for the races she enters. “You get a lot of alone time during events like that,” she said, adding that she uses it to contemplate her work and her many contributions to the community, including participation with the Women’s Partnership, Dress for Success, and other initiatives — and maybe do some mental studying for the next SATs. Zinter has a theory about why so many young professionals are being drawn to distance racing and other extreme tests of their mind and body. Like taking the SAT every year.